LAUSD schooling: No LAUSD. Attended public high school in Springfield, Mass. Other education: A graduate of Goucher College in Baltimore where he was recognized as a Distinguished Alumni. Masters at CSU Los Angeles. Platform: Bringing people together to bring change in their schools and public education. Access and equity for every student to reach their dreams through public education. Bilingual education, helping Dreamers, and 100 percent graduation. Campaign funding: Zimmer has raised $159,812 and spent $86,974 as of Feb. 18. As of Feb. 24, independent expenditure committees funded by unions have spent $878,169 to support him, and IEs funded by former LA Mayor Richard Riordan and the California Charter Schools Association Advocates have spent $1,402,107 to oppose him. Key endorsements: Los Angeles County Democratic Party, Planned Parenthood, Stonewall Democrats Club, United Teachers Los Angeles, Service Employees International Union Local 99, Armenian National Committee of America, Los Angeles Mayor Eric Garcetti, California State Superintendent of Public Instruction Tom Torlakson, Congresswoman Maxine Waters, Congresswoman Judy Chiu, Los Angeles County Supervisors Hilda Solis and Sheila Kuehl. It seemed like it took a long time for Steve Zimmer to start campaigning. 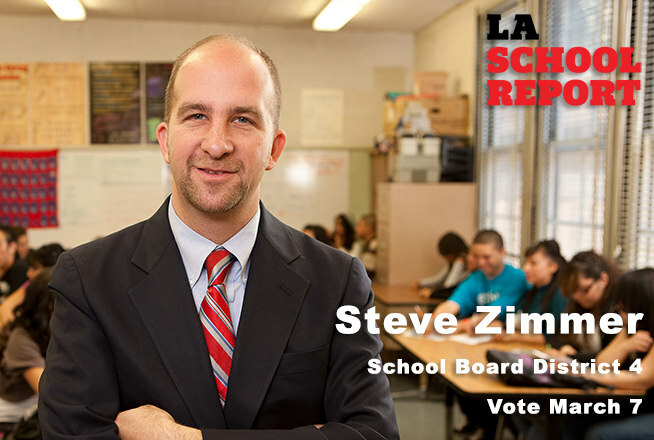 His three opponents jumped in the race, held fundraisers and posted websites long before anyone heard from Zimmer, who is the school board president and has been elected twice to LA Unified’s board, first in 2009. Due to term limits, this is the last time he can run, and campaigning is not his favorite thing. Sitting at the Elysian Valley Community Services Center, Zimmer spoke while grabbing a quick kale salad and unsweetened green iced tea. He helped create the center that offers a library, internet access, and recreation to the northeast Los Angeles neighborhood and also houses a continuing education program. It was before yet another of a half dozen candidate debates in the most hotly contested of the three March 7 school board races. Even after they agreed during one forum that they all oppose Trump administration policies, Zimmer said he wouldn’t put himself in the same category as his opponents. Zimmer started his educational career working for Teach for America in 1992 dedicated to educational equity, which became his guiding principle ever since. He served as counselor and teacher for 17 years at Marshall High School and took a pay cut of nearly half his salary to become a board member. He points to two primary points his opponents make. “They are pretty irresponsible lies,” Zimmer said. “The first is that there is a $1.3 billion deficit. Well, no one believes that. You only get that if you add up all the liabilities in their worst-case scenario and don’t use any of our assets. Nobody believes that that number is accurate. We wouldn’t be solvent if that were the case. That doesn’t mean that there aren’t legitimate budget concerns. “What it’s really about is control of the school district and the charter system taking control of the school board. Even people who are strong charter supporters don’t want that. Zimmer pointed to increases in standardized test scores, magnet school expansion, and the success of implementing the A-G classes, which are needed to get into public state universities. He said he didn’t agree with allowing kids with D’s in those classes to graduate, but he said he agreed to compromise and go along with the 2015 board vote for the sake of unity. “Are kids getting a college-level curriculum, are they getting the A-G’s? Absolutely, and that was not happening 10 years ago. Of course, it’s not flawless, we’re changing mindsets. He said he believed the charter schools exploited the budget crisis during the recession in 2008 by creating more and more charter schools rather than improving the ones that already existed. “The charter movement in Los Angeles used — and I would argue — exploited the budget crisis to have a massive acceleration of new charter schools,” he said. “The truthful analysis of us losing children to charter schools is that when the economy collapsed, our charter partners could have said, ‘Hey, we understand, you’ve authorized a lot of charters pre 2008-09 and we’re going to really perfect these models of innovation, work really hard with what we’re doing and make every charter school you’ve authorized truly outstanding and throughout this budget process and after the budget crisis you should stabilize yourselves and then we’ll talk about expansion,’ but that’s not what happened. He pointed out that he has authorized more charters than he has denied, but he added, “The loss of students to charter schools through declining enrollment is a very serious issue. Zimmer said he supports many successful charter models, such as the independent conversion charter high schools including Palisades Charter High, where one of his opponents, Allison Holdorff Polhill, served on the board. “I support Pali, she did a good job while there. But we struggled with El Camino High (another charter conversion) because it was being led by someone who didn’t follow the rules. We’re trying to have a more transparent charter process. “That doesn’t mean I’m closed to any new charters, I think that Crete Academy helping the homeless is great and could have been done in a district school but we didn’t provide that opportunity. They wrote an innovative and very progressive charter plan and I was happy to support it. Zimmer said he believes the district will change drastically in the next five years, and he wants to be a part of that change. Zimmer traveled extensively to Washington, D.C., and Sacramento to lobby for additional revenue sources and pressed for an Education Jobs Bill that yielded $10 billion for education. “We are 43rd in the nation in per-student expenditures, and it is a precarious a time in public education. For Zimmer, it remains about the children, particularly the 84 percent of the second-largest school district who live in poverty.